The New Zealand government finally got around to telling the tobacco companies what the rules will be under plain packaging. Plain packaging won’t be in effect for a while yet, but it takes a while to adjust production lines – it’s good that they finally got the rules out. Fairfax’s Rob Stock called me asking for comment on plain packaging. I told him that the government should have put its efforts into getting a regulatory framework in place to allow the sale of e-cigarettes and other nicotine delivery devices (heat-not-burn products, and Swedish snus). The effects of plain packaging in Australia haven’t been large, and a lot of smokers might be more responsive to available better alternatives than to ugly packaging. Eric Crampton from the New Zealand Initiative think-tank, which is funded by big business including British American Tobacco and Imperial Tobacco, said evidence from Australia showed plain packaging was not having a big effect. The Chipty report in Australia published last year concluded plain packaging had had an impact on smoking rates. Crampton said the Ministry of Health had been slow to get its regulations out, and questioned the cost to government for the benefit that plain-packaging would bring. He also called on the government to move more quickly to legalise e-cigarettes and heat-not-burn devices that are less harmful alternatives to cigarettes. He didn’t mention the Chipty report during our chat, but neither did I. When I said that it hasn’t done much in Australia, I was thinking about it though. Chipty found that plain packaging reduced smoking rates by about a half of a percentage point. Rob presents that as tobacco-funded-me against an expert report, but I suppose it’s more of a judgment call on whether a half a percentage point constitutes any kind of big effect. Anyway, here’s the Chipty report. And here’s something that’s been bugging me about it; maybe if your econometrics are better than mine you can tell me there’s nothing to worry about. 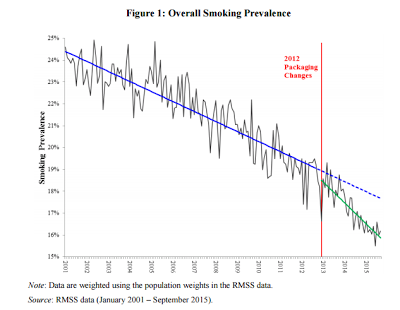 Anyway, tobacco use has been in long-term decline. Just running a dummy variable for a post-implementation period would overstate the effects of the policy, as Chipty rightly notes. But Chipty solves this by throwing in a linear time trend. Now that would be fine if the time trend actually were linear. But if the actual time trend showed an accelerating decline independent of plain packaging, then you’re back into the same problem. When I see something like that, I start wondering whether anybody ran a structural break test to make sure that the shift actually coincides with the policy change. If I had to eyeball it, it looks like a flat trend from 2001 through maybe 2005, then a decline through about 2010, then a sharper decline from 2011 through 2016. It is stupid to try to eyeball it, because that prevalence rate will be reflecting all kinds of things going on in tax which would be controlled for in the regressions. But without a break test, it seems odd to just run (effectively) the 2001-2012 model’s estimates through 2013 onward as a counterfactual. Especially where the pre-period includes a lengthy period from 2001 to 2005 where it looks like noise around a pretty flat trend. And… aww crud. Googling around to see if anybody’s checked for that. And somebody has. It looks like Japan Tobacco commissioned some work, and the first thing the consultant did was go for a structural break test. And they found breaks at 2005 and at May 2012, albeit just on the outcome time series and not in the controlled model because Chipty didn’t share data. And so anybody so-inclined will just reckon I cribbed from some tobacco playbook – though I swear I did not see this until I started Googling. I hate one-sided skepticism: Chipty must be right because she was government funded, even if it looks completely obvious that a statistical break test was necessary and wasn’t undertaken. Fun and games. Anyway, if you’re an econometrician and that graph doesn’t seem to be screaming to you that we can’t just infer policy effects from a dummy variable for the post-2012 period and a linear time trend, let me know why. > Fairfax’s Rob Stock called me asking for comment on plain packaging. I told him that the government should have put its efforts into getting a regulatory framework in place to allow the sale of e-cigarettes and other nicotine delivery devices (heat-not-burn products, and Swedish snus). I’ll go further than that. The messages depicted on cigarette packs should include at least some that promote THR! 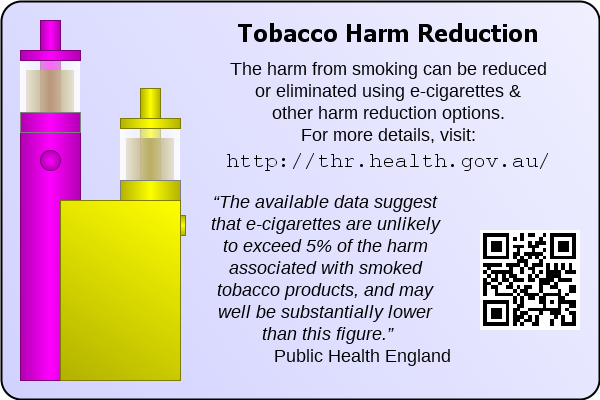 This example shows an image proposed for inclusion on cigarette packs in Australia, but could be easily adapted to need..